This week's Wednesday with Donna Hay is a little taste of Asia, as Margaret chose Asian Mushroom Omelette, the recipe for which is online here. To see what Margaret, Sarah and Kayte thought of this dish, visit their websites. This week's French Friday with Dorie recipe is Green as Spring Veal Stew - except that in my case, I used beef, so that makes it Green as Spring Beef Stew. The green comes from a mix of rocket (arugula), spinach and herbs in the sauce. I am not sure what I was expecting with this one, but I imagined something green and pretty - whereas this looks like a stew, and hence not pretty, although tasty. I didn't throw away the vegetables with which the meat was cooked - I saved them and ate them on the side. I really don't have a lot to say about this stew. It tasted OK, if rather grassy, but it didn't grab me enough to make it again. 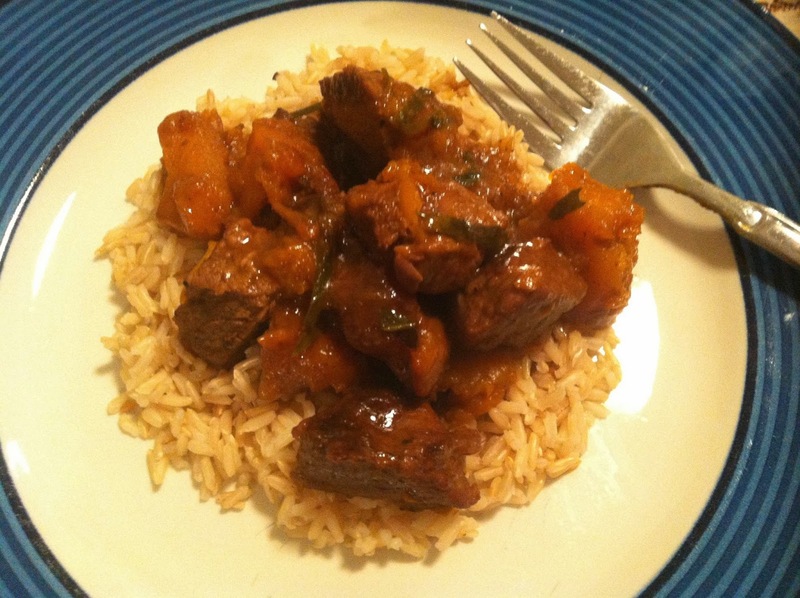 To see what the other Doristas thought of this stew, visit the LYL section of the FFWD website. As you read this, I will be winging my way to Chicago for the start of a Route 66 coach tour, so no FFWD for me for a while. See you when I get back! For Wednesday with Donna Hay this week, Kayte has chosen Potato, Rosemary and Goat's Cheese Tarts from p158 of Modern Classics I. 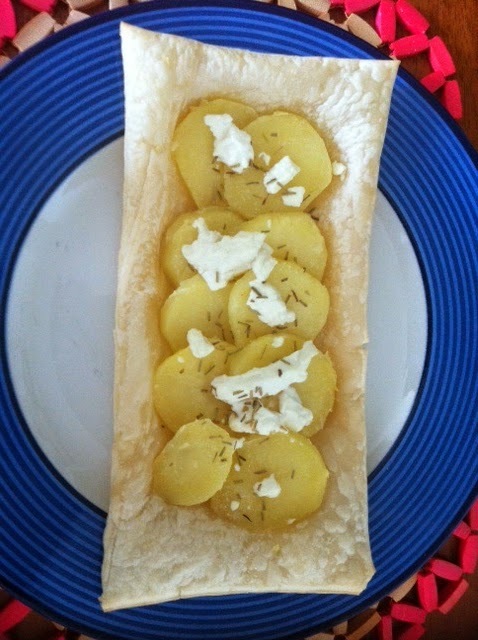 These are little puff pastry rectangles topped with slices of boiled potato, dollops of goats cheese and sprinkled with rosemary. These tarts are simply but effective. I think a sprinkle of some spices would really lift these, but they are fine as they are. To see what Kayte, Margaret and Sarah thought of these tarts, visit their websites. Recently, I had a weekend of fancy eating, with food so good I have to share. It started at Friday lunch, with a legal team catchup at Taxi Kitchen in Federation Square, Melbourne. We had the lunch special, being $39 for two courses and a glass of wine. I had no idea what sea lettuce was, but the meal itself was delicious. I'd definitely order this again. This dessert was visually gorgeous, and the taste did not disappoint - like lemon sorbet atop a biscuit with meringue on top. I think the pink crumbs were freeze-dried raspberries. Verdict - not cheap, but delicious. This is a light, pleasant brew that goes down easily. Both meals were served with mustard, mashed potatoes and sauerkraut. I had a two for one voucher, so our meals were half price. This is a light, fruity dessert with a crispy pastry shell. It was served with icecream and custard, and was a lovely way to finish the meal. Verdict - hearty fare, perfect for winter. The ravioli was light and delicate, and served in a lemony sauce. I washed it all down with one of the many house teas. As always, it was a delicious experience in lovely, old fashioned surrounds. Just be prepared to queue for around 15 minutes to get in. We are going crazy for spring veges this week at French Fridays with Dorie this week with Baby Bok Choy, Sugar Snaps and Garlic en Papillote. Yes, I realise that in the Southern Hemisphere, we are coming into winter, but most of the Doristas are in the Northern Hemisphere, hence some lovely green spring vegetables are perfect for them at this time of year. So, what's all this "en papillote" stuff about? Well, it's just French for cooking in a bag - on this occasion, a foil bag made by folding alfoil around the vegetables before baking them in the oven. It's quite a nifty way to cook that I learned from Jamie Oliver years ago, back in his "lovely jubbly" days. It keeps all the moisture in, facilitates preparation in advance, and is a "set and forget" method of cooking. I served my veges in a bag with tahini, cumin and buttermilk chicken from WWDH. To see what the other Doristas thought of their veges en papillote, visit the LYL section of the FFWD website. For Wednesday with Donna Hay this week, I chose Red Thai Beef Curry from p104 of Modern Classics Book I. You can also find the recipe online here. This thick, rich beef curry uses store bought curry paste for convenience, and contains pumpkin to beef it up a bit. I served the curry atop a helping of boiled brown rice. I used light coconut cream to try and cut down on some of the calories. This was melt-in-your mouth delicious, and I would definitely make it again. If you are a lover of curries, you can't go past the taste and convenience of this Donna Hay recipe. To see what Margaret and Sarah thought of this curry, visit their websites. Easter is almost upon us, hence 'tis the season for making hot cross buns. I have always wanted to try making my own hot cross buns, and was sold when I saw a recipe in this month's Gourmet Traveller Magazine for sour cherry hot cross buns. The recipe has been posted online here. Instead of sour cherries, I used dried cranberries, as I already had some in the house. These buns do take some time to make, so think of it as a half a day project while you wait for risings, baking etc. The buns are not hard to make. The hardest part for me was marking the cross - the first piping tip I used was too thin for the flour paste used to mark the cross, hence I expended lots of energy getting nowhere before switching to a broader tip. Remember to put the glaze on while the buns are still hot (although the recipe is silent on this). If you are looking for a good hot cross bun recipe to cut your teeth on, I recommend trying this sour cherry hot cross bun recipe (with cherries or other fruit). Today is Edna's birthday. I brought Edna's cake into work on Friday so that she could enjoy it with everyone at work before her birthday. 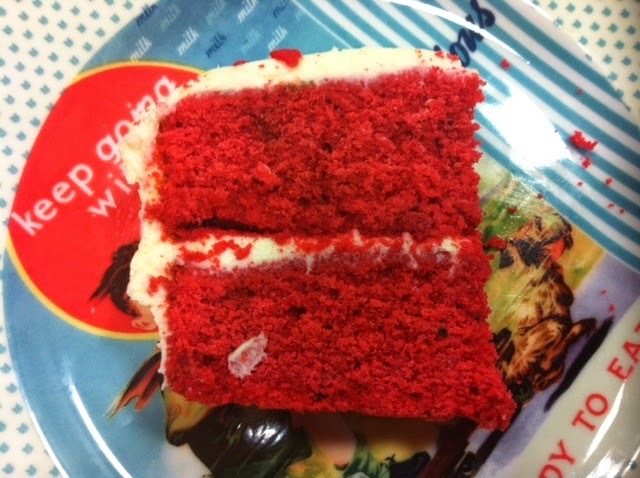 I asked around as to Edna's favourite cake flavour, and as it turns out, it's red velvet. By good fortune, I had just bought Sweet and Vicious: Baking with Attitude by Libbie Summers. This book is awesome - just take a look at the video here. It has hot pink tipped pages, a sassy cover, fabulous photographs and great stories, not to mention recipes that are a little different. This book is my kind of cookbook! Libbie happened to include a recipe for Best. Ever. Red Velvet Cake, which she makes for her now husband as it is his favourite cake. Perfect!!! This had to be the cake for Edna. The gel pen gave me grief by squirting unevenly - at one stage I had to scrape off the writing because it was so messy, and this unfortunately left a faint red stain in the frosting. No matter - I was happy with the overall result, and there were no complaints from Edna about it. I really enjoyed this cake too - it is as smooth as silk, not overly sweet, and the tangy frosting makes a nice contrast to the cake itself. 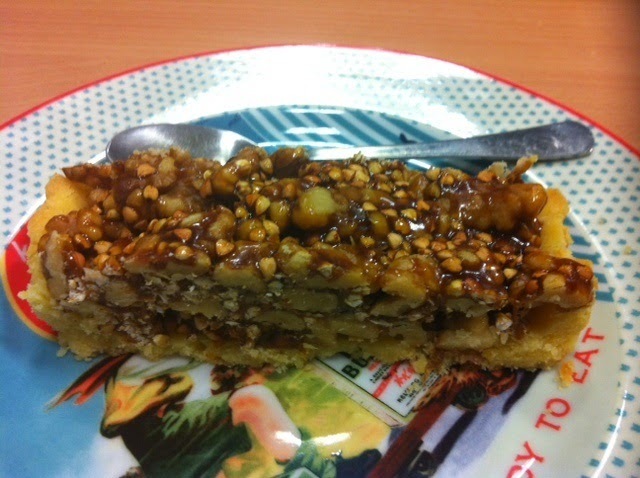 This cake is seriously yum - I can see why Libbie's husband loves it. If you would like the recipe, I seriously recommend buying Libbie's book - it is truly fabulous, and well off the beaten track of your typical baking book. This week, our French Fridays with Dorie assignment was Quiche Maraichère - literally a "market fresh" quiche. This quiche is unusual in that it is mostly vegetables with only minimal custard, and the cheese is on top rather than through the quiche. The vegetables were leeks, carrots, capsicum and celery, and were finely diced then pan cooked before being placed in a par-baked tart shell and covered with a custard of eggs and cream. Close to the end of baking, the quiche is topped with grated cheddar cheese. This was another surprise hit for me. To see what the other Doristas thought of this quiche, visit the LYL section of the FFWD website. It has been a week of using up lacklustre fruit from the end of the season. I had a kilo of peaches languishing in my fridge because - well, they were pretty bland peaches. However, I didn't want to waste them. Initially, I thought of making baked goods with them, but I thought that a whole kilo of peaches would take an awful lot of baking to use them up. Plan B was to make jam! I searched for the right recipe for peach jam for me, and I chose Maggie Beer's Peach Jam recipe from The Cook and the Chef TV series. 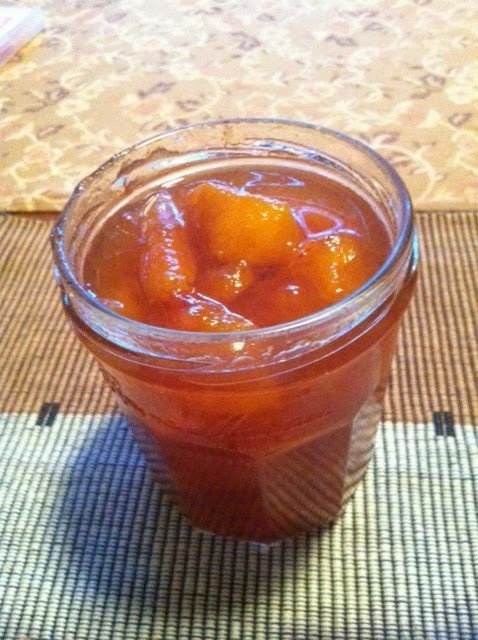 I liked the fact that Maggie did not peel the peaches - she used the whole fruit in her jam after de-seeding them. In fact, she even uses the seeds in the cooking process, presumably to add flavour. Instead of amaretto, I added brandy to my jam. I am so glad I didn't skip it - the alcohol added a lovely flavour to the jam. This jam is so versatile. As well as indulging my habit of eating jam out of the jar, I have been mixing it in with my rolled oats for breakfast and putting it on icecream for dessert. It would also be fabulous in muffins, to fill cakes or on toast. And it transformed some very ordinary peaches into the extraordinary. Perfect! Wash the peaches, then cut the peach flesh off the stone and chop into pieces. Place a large, heavy based saucepan over low heat. Add peaches, lemon rind and juice and allow to simmer in the juice that will ooze from the peaches, stirring occasionally. When fruit is soft and beginning to fall apart (~ 20 minutes), add the sugar. Once sugar has dissolved into the fruit increase the heat. Allow to boil rapidly until setting stage has been reached, stirring occasionally so nothing sticks to the bottom of the pot. Carefully spoon the hot jam into glass jars and top with the lids. Turn the jars upside down while cooling to sterilise the whole of the jars with hot jam. For Wednesday with Donna Hay this week, Sarah chose Tahini, Cumin and Buttermilk Marinated Chicken, from p26 of Donna Hay Magazine Issue 68, April/May 2013. I was not sure how this combination would go - the tahini, buttermilk and cumin mixture is used to coat chicken thighs before baking. However, I need not have worried, as the end result is a moist, flavoursome, nutty tasting chicken. I served my chicken with Baby Bok Choy, Sugar Snaps and Garlic en Papillote, a future FFWD assignment, and microwave-baked sweet potato. Place the buttermilk, tahini, juice from half the lemon, garlic and cumin in a bowl and mix to combine. Add the chicken and toss to coat. Place the chicken in a non-stick baking dish, drizzle with olive oil, sprinkle with salt and pepper and bake for 30 minutes. To see what Sarah and Margaret thought of this dish, visit their websites. We are slowly and steadily working our way through mid autumn in Melbourne. Daylight savings has ended, it is dark in the mornings and the early evenings, and it is getting cooler. Autumn also marks the end of the last of the summer fruit in the supermarket. Although strawberries are available all year round because of modern growing methods, they are at their best in the summer. I bought some strawberries on sale recently, but they were small, pale shadows of the large, juicy summer strawberries. To avoid wasting them, I decided to make a strawberry cake. I settled on this strawberry loaf cake cake from Pixels and Crumbs. I liked it because it used oil rather than butter, and contained tangy Greek yoghurt. I cut the sugar by half, and found the cake to be sweet enough without the extra sugar. The use of oil means the cake is not as fluffy as a buttery cake, and has a rather smooth, close crumb. However, it was still delicious, and was a rather good way to use up some otherwise lacklustre strawberries and elevate them to a new level. While scrumptious on its own, I think this cake would be superb served with a scoop of vanilla icecream or some warm custard. Some time ago, I made Black Vinegar Cake with Sour Cream Icing from Adam Liaw's book, Two Asian Kitchens. Unfortunately, at that time, I did not have black vinegar, so I substituted balsamic vinegar instead. These cakes are dense and fruity and not overly sweet. Although they are not your average cake, you would never know that they contained vinegar. I am not entirely sure whether Yvonne liked her black vinegar cupcake or not, but they disappeared at work, so I am going to take that as a good sign. I think this cake is an intriguing concept, and interesting to make if you have some dried fruit about the house that you have spare for baking. For French Fridays with Dorie this week, our assignment is to make a cake named after an order of French nuns - the Visitandine (recipe here). This is a very simple white cake made with egg whites. Dorie suggested using the cake as a base for strawberry shortcake to dress it up. The photos in her book of the "strawberry shortcake" Visitandine were so enchanting that I decided this was the route I had to go. I split the batter between two 9" pans for baking, then sandwiched a slice with Greek yoghurt, raspberry curd and fresh raspberries. It was the perfect treat for a sunny, warm autumn day. Both versions were great, though of course the "raspberry shortcake" version was the best. The cake is light and vanilla-tasting, so would complement a variety of flavours. To see what the other Doristas thought of Visitandine, visit the LYL section of the website. Unfortunately, the place where I live is not that great at picking up signals. Wifi is a nightmare, with the connection dropping in and out (if it connects at all), so I changed to ADSL. Also, since the advent of digital television, I have been without SBS. This has nothing to do with the need to retune my TV - even before the cutover from analogue to digital TV, I could not get SBS on my digital TV. Someone suggested that I need to shift the TV aerial, but this is not possible when I live in rented accommodation. Accordingly, for now, I must live without SBS. In real terms, this means that I must live without their fabulous Thursday night cooking shows. One of the shows that I did not get to see on SBS was Rachel Khoo's The Little Paris Kitchen. This is rather sad, because Rachel's books that accompanied the show look charming, and I can only imagine that the show brought the books to life. However, I did have a stroke of good luck in that I found a copy of Rachel's latest book, My Little French Kitchen, for half price at the bookshop because someone had ripped the dust jacket in one place. Fabulous! The rip doesn't bother me or affect the useability of the book, so I made the easy decision to take it home. There are many delicious sounding regional recipes from all over France in My Little French Kitchen, accompanied by beautiful photographs to make your mouth water. A recipe that immediately caught my eye was for Walnut and Buckwheat Caramel Tart. I love caramel, and I was intrigued by the use of buckwheat - and I just happened to have half a jar of buckwheat left over from my failed attempt to like buckwheat smoothies. Accordingly, I bought the remaining ingredients and this tart became the first recipe that I made from My Little French Kitchen - Australian style. The grassiness of the buckwheat is not evident in the flavour of the tart, and the buckwheat serves merely to provide some added crunch. 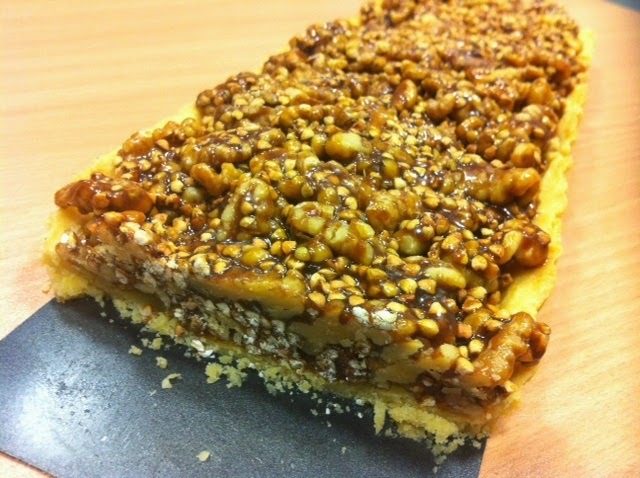 Walnuts and caramel are a match made in heaven, and the whole kit and kaboodle sits atop a sweet shortcrust base. You can find the recipe for this tart here. I won't give you the sweet pastry recipe, because you can use any sweet pastry that you like (or buy a ready made shell), and I personally found this pastry difficult to work with before and after baking. It is very soft, and I had so much trouble with getting it off the paper once rolled out that in the end, I just scraped it off the paper and pressed it into the tart pan. Once baked, the pastry seemed rather crumbly. To toast the buckwheat, you just heat up a frying pan and dry toast the buckwheat in the pan (ie no oil) for around five minutes or until it has turned golden and smells nutty. And boy, is it a heavenly smell! The caramel recipe surprised me because you only caramelise half of the sugar, and rest of the sugar is dumped into the caramel with the rest of the filling ingredients all at once. Do be careful when pouring the other filling ingredients into the hot caramel, as it really does spit angrily, and you don't want a caramel burn on your arm (or anywhere else). You need a large, sturdy knife to cut the finished tart into pieces, but it is well worth it. The flavours and textures blend well together, and a slice of this tart is a perfect treat for morning tiffin. Last weekend, my friends J and S came down to Melbourne for a visit. They had originally been going to a concert which was cancelled, but as their flights and accommodation were non-cancellable, they came anyway. They couldn't have picked a nicer weekend - the weather was warm and sunny, and you would never know that autumn is upon us. On Sunday, I was invited to go for a jaunt with them to the Yarra Valley. I hadn't been there for years, and it was perfect driving weather, so I was very happy to accept. We arrived at our destination early for our lunch booking, so we filled in a happy hour or so at Maddens Rise Winery, where we were greeted by Archie, an enthusiastic Jack Russell, and a friendly wave from his owner, Emma. Emma took us through a tasting of all of the Madden Rise biodynamic wines, and they were so unexpectedly good that I bought four bottles (despite not intending to buy any wine at all). My favourite was the Pink Fizz - pink bubbles, what's not to love? We had such a good time that we ended up being half an hour late for our lunch booking at Locale, at the De Bortoli Winery. However, we phoned in advance to say we'd be late, and we luckily had our table waiting for us on arrival. Locale is a light, bright, airy space, which provides a relaxing atmosphere in which to enjoy the fine dining menu. You may choose to either have two courses for $55 or three for $68. Sensibly, we opted for three courses! My favourite part of this was the flavoursome celeriac remoulade, although it was of course all very tasty. The standout element of this dish was the red wine jus - Manu from My Kitchen Rules would love it! The shallots cooked in the jus were also very tasty. The beef was meant to be medium rare, but arrived served medium - this was fine with me, as I am not that fussy about how my meat is cooked, as long as it hasn't been charred to a cinder or subdued into a compound akin to rubber. The donuts were only tiny, and not quite what I expected, but delicious all the same. The cannoli was suitably crispy and shattered in your mouth, and the creme patisserie filling was smooth and creamy. The honey gelato added a shot of intense sweetness to the platter, and the pistachio crumb added some texture. Everyone enjoyed their menu choices, and we left full and happy. The staff were efficient and courteous, and we promptly received each course and beverages. Locale at De Bortoli was an enjoyable dining experience that I would gladly revisit. Friands are a favourite in Australian cafes. The word "friand" means "little delicacy". They are closely related to the French financier, being made with egg whites, icing sugar and almond meal, but they are baked in an oval shape rather than a bar. Friands come in all sorts of flavour combinations - you can flavour the basic friand recipe however you like. 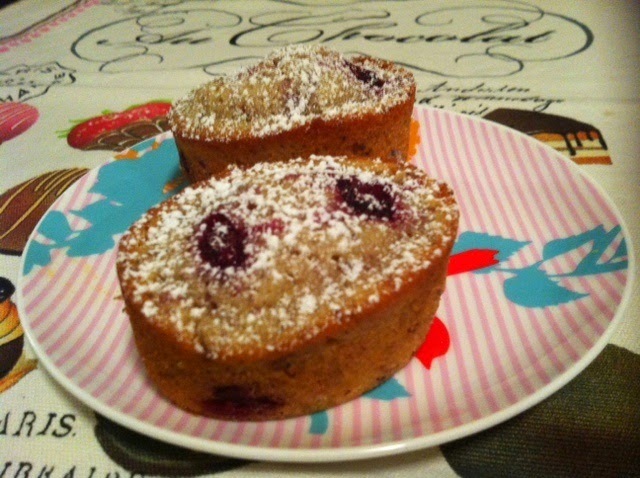 I adapted a mango and pistachio friand recipe to make raspberry friands. I was very pleased with this recipe, as the resulting friands were lovely and moist - I have had problems in the past with friands being too dry. Raspberries added an irresistible flavour to the basic friand. Grease 10 holes of a friand pan (or 10 standard muffin holes), and pre-heat your oven to 190 degrees Celsius. Sift the flour and icing sugar into a large bowl, and stir in the ground almonds. Make a hollow in the centre of the dry ingredients. Beat the egg whites until foamy, then pour into the hollow in the dry ingredients with the butter, vanilla and lemon juice and fold together to combine. Gently fold through the 1/2 cup raspberries (not thawed). Divide the batter between the 10 greased friand holes. Press two raspberries into the top of each friand. Bake for 20-25 minutes or until cooked through. Cool friands in the pan for ~ 5 minutes before unmoulding onto a wire rack to cool. Dust tops of cooled friands with icing sugar.